Ran the standard tempo 3 miler down the Provo Canyon in 15:35. Mile splits - 5:10 - 5:16 - 5:09. On the positive side, no quarters slower than 1:19, and all 1:19 quarters felt fairly comfortable. On the negative side, 1:18 quarters felt a lot more painful, and the last one in 1:15 did not feel good at all. This predicts about 2:25-2:26 in St. George given good conditions, but I have another week to get my spine into a better shape, which in theory could happen any day. So there is still some hope for a qualifier (2:22:00) in St. George, but if not, the spine will get beat into good shape eventually, I hope, and then the Trials qualifier would not have to be done in St. George. I hope to see the real Sasha come out of hiding in some near future day. Afterwards, 5x400 down with 200 recovery. 69.3 - 71.2 - 69.4 - 68.9 - 67.5. I knew there was something up with the second one, as it felt too aerobic. Sure enough, the clock testified that it was not because I gained fitness. On the last two, I focused on bringing my hips forwards to avoid the bucket sitting, and my lower back somewhat cooperated. I felt the best on the last one, not counting the 71.2, where my mind was still half way into the tempo run. Ran with the kids in the afternoon. Also took Benjamin to the track to check his sprint speed. 19.4 in 100 meters, same as before. We got an offer on our house tonight, and we accepted. Now we will move on to make an offer on the house we like near the Provo River Trail. Bench press in the evening - 3x[5x105lb]. It is interesting to read your training ideas, Sasha. I am going to take them into heart as I work to bring my times down toward yours through this next year +. Congratulations on the sale of your house. I am going through the same thing right now and know how stressful it can be. tell me what you think of this pace chart for the st.george marathon? It would be helpful for me and maybe some other runners to see one of your pre 48 hour marathon diet's. I've found things that work and don't work for me, but would be interested to see anouthers outline. Also to any one else- What should be avoided at all costs and what is good? I know the standard no pop, fast food, ect, but what are some other hints? Any ideas would be helpful as I'm totally second guessing everything right now. Not only food but what about other things like creotine(that could be spelled wronge), cytomax,??? The problem is not that the back is not feeling good. The spine bends the wrong way which, I believe, is the reason I cannot sprint faster in 100 m than 13.9, cannot run a 5 K faster than 15:37, and have always been a clumsy kid. I am currently undergoing a spinal correction therapy. If I see some fruit of it by Saturday, the qualifier becomes reachable. Otherwise, we are looking at 2:25-2:26. Bill - the calculator is fairly accurate. However, pace yourself more by how you feel rather than by some pre-calculated formula. Use the formula only to evaluate your performance, but not to make a decison on if you should go faster or slower. Clyde - I do not drastically change my diet with 48 hours to go or at any given time for that matter. However, for convenience sake, and also to avoid bathroom problems, I swap lunch and dinner on Friday. A banana 3 hours before the race, another an hour before the race - this provides energy, but there is not enough time for them to travel down the digestive tract far enough to cause problems during the race. The most important thing in the last 3 days before a marathon is to sleep and not to stress about anything. Avoid disruptive home repairs, family arguments, stressful business projects, and other things that raise your levels of adrenaline. Particularly, do not stress about the race. Humble yourself and be willing to take what you deserve, be it faster or slower than your dream goal. Your best possible time has already been decided by your training. However, your actual time has not been decided, and if you worry about how fast you are going to run, you are only getting further behind your best possible time. Never tried creatine or cytomax. Thanks for the good information you've just posted Bill, Clyde, Steve and myself talk about a lot of different things and share different ideas, always good to get information from someone like yourself that has run a number of marathons. Dave Holt has also started running with us some which is good to get another good runner out with the running club. I feel like everyone in the club is going to have good races, I know Clyde gets pretty nervous, but he is really in good shape and should have a strong race, the rest of us shouldn't be to far behind. I like the suggestion of not stressing so much on a pre-calculated time, but more on how you feel. 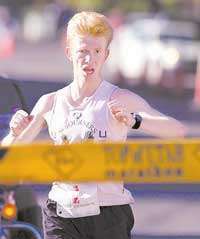 I'm just curious on your race predictor has the Hobble Creek Half to St. George comparison been pretty close over the years. I ran right at 1:16:00 for Hobble Creek this year and I'm just trying to set a realistic goal for Saturday. I am feeling in great shape in ideas? Also I don't know if you have talked to Steve lately but we are planning on staying the night up at my in-laws cabin in Pine Valley, they have plenty of bedrooms and even two toilets you can break( just a joke, read your experience in Logan) We probably won't head up until a little later in the evening Friday I have some family coming into town and Bill has to work until 5.